If you want to create the illusion of stone walls but do not have the ability to work with actual stone, you can use Styrofoam as a reasonable facsimile. Styrofoam is relatively durable and will stand up to repeated uses, like as the background of a theater set, but also is easy to carve and accepts paint well. Creating stone walls out of Styrofoam requires an artistic touch and the right tools, but the end result is light, portable stone walls that you can use for a variety of purposes. Draw the outline of the stones directly onto your Styrofoam sheet. 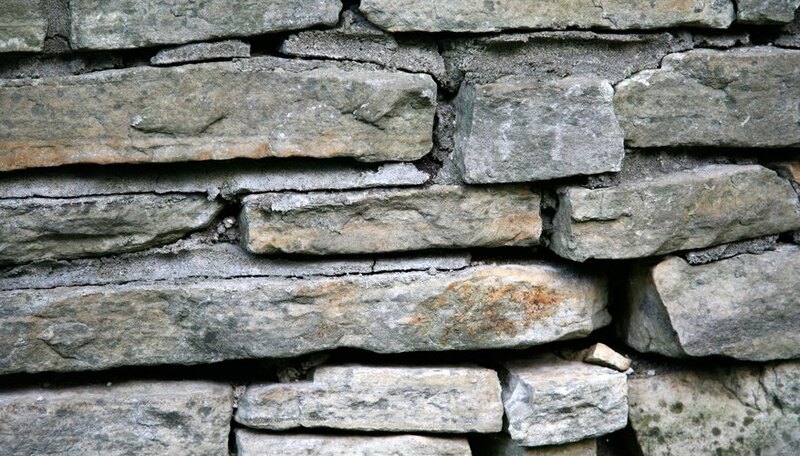 You can use a source image of a stone wall as a guide, or project an image directly onto the sheet for accuracy. Heat up the wire cutter and use it to slowly sculpt stone shapes into the foam. You can carve lines to represent the mortar in between the stones and shave thin layers off the surface to create round or flat stones. Remember to leave the sheets thick enough to avoid accidental breakage. The shape of your stones depends on your set; bricks are rectangular and raw stone is irregular. Continue carving stone shapes into the sheet until the entire sheet has the rough appearance of a stone wall. Cover each stone in a thin layer of clear glue and brush a layer of sand over the surface. This adds texture and realism to the stone. Coat the walls in gray, brown or red acrylic paint, depending on what type of stone you would like to mimic. Do not use spray paint, as it will melt the Styrofoam.